I thought it was best to get the gratuitous and possibly bad taste lamb photo out of the way early on. 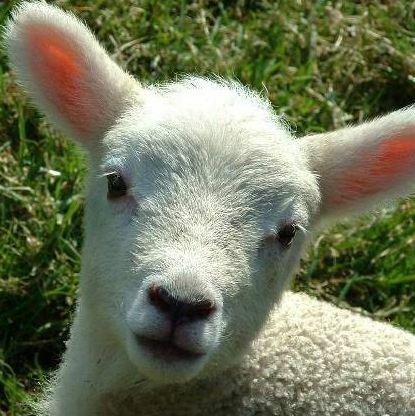 Please, don’t be offended – I love lambs as much as the next person, especially if that person is cooking this spicy, slow cooked lamb shoulder in my oven, then serving it up to me with crispy roasted potatoes and steamed greens. This is my version of a Hugh F-W recipe. It is a firm favourite in our house for a number of reasons, not least because it is very low-maintenance and extremely delicious. Mature lamb (ie, the sort that lies about being younger than it is) is especially good cooked this way. Preheat the oven to 220C. Toast the cumin, coriander, peppercorns in a dry pan until fragrant. Tip into a mortar and add the garlic, rosemary, smoked paprika, dried chilli and salt. Crush/grind for a bit, then add the olive oil. If you don’t have a mortar you can do this in a mini food processor or just use a bowl, a wooden spoon and lots of elbow grease. Score the skin of the lamb and put it into a large, lidded, ovenproof dish (like a Le Creuset or similar). Rub half the spice paste over the meat, then put in the oven for 30 minutes. Take it out and rub the remainder of the spice paste on to the meat (I use the back of a spoon). Tip a small glass of water into the pot (not over the meat), put the lid on and return to the oven, turning the heat down to 120C. Let cook for at least six hours, until the meat is falling off the bone. If you want to cook this in advance, remove the meat from the pot when it is done and discard the bones. Pour the liquid into a container and let cool, then refrigerate both the meat and liquid. To reheat, put the meat back into the (now clean!) pot. Scrape the layer of fat from the now jelly-like liquid and throw it away quickly before anyone sees. Put the jellied liquid in with the meat and reheat at 150C until piping hot. What a divine recipe! Can't wait for the new oven to get cracking with delicious stuff like this. If I make those crispy roasties will you come…? Ah you are definitely my kind of girl! Loved the lamb picture and the tasty way he turned out in your recipe. Are you going to show us some of your snow? Lamb looks amazing – must try it and not necessarily in the cold weather. Have been hearing about your snow from friends who are on sabbatical in NZ. They are now in a Motorhome (!) and last heard of near Queenstown, but I have no idea where that is. They say that the snow is the worst for 40 years! Are you very snowed up too? It's Summer in the UK of course – not the time of year I would choose for a trip even though I would love to visit NZ. How fantastic. Love a great roast lamb like this. Absolutely scrumptious. This looks like the perfect Sunday dinner. I'll keep it in mind for when I reclaim my weekends back from travelling and Wellington on a Plate! By the way, my lemon thyme is thriving and has gone into many a cup of tea! Sounds delicious. Made me hungry.